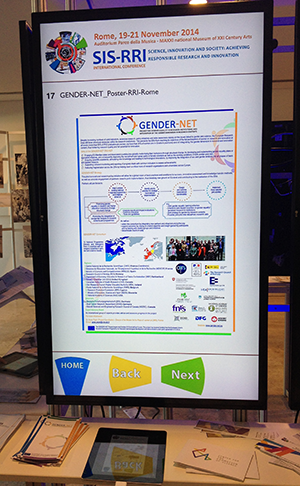 The GENDER-NET project was featured in an interactive poster session and projects market place at the SIS-RRI international Conference (“Science, Innovation and Society: Achieving Responsible Research and Innovation”) organised in Rome on November 19-21, 2014, under the auspices of the Italian Presidency of the Council of the European Union and supported by the European Commission. GENDER-NET was also mentioned in the session dedicated to Gender Equality – one of the six RRI keys – and chaired by Anne Pépin, member of the Conference’s Steering Committee, and is featured in the Stocktaking Study, drafted by the Local Scientific Committee, on the Science-in-Society projects funded through FP6 and FP7 and their effectiveness regarding the RRI keys. Download the Stocktaking Study here and read the Chapter on Gender Equality prepared by Rossella Palomba, former director of research at Italian CNR and co-author of the EC’s pioneering 2000 ETAN Report on Women and Science "Science Policies in the European Union: Promoting excellence through mainstreaming gender equality". One of the main outcomes of this EU-supported Conference was the Rome Declaration on Responsible Research and Innovation. You can download it here.